In addition to a typescript copy of Sylvia Plath's Circus in Three Rings that she compiled in Spring 1955 as she was preparing to graduate from Smith College, the Lilly Library of Indiana University, Bloomington, has a typescript copy of Plath's The Colossus and other poems in Box 8, Folder 8, that she submitted, like other collections, to the Yale Series of Younger Poets. Plath considered marketing a book to the Yale Series of Younger Poets starting in 1955, around the time she assembled her Circus in Three Rings. Also, she intended to send something to them in June 1956. Whether these first two happened or not I am not sure. Plath did submit Two Lovers and a Beachcomber on 16 February 1957 (rejected 8 August 1957) and The Bull of Bendylaw and other Poems circa late February or early March 1959 (rejected 6 June 1959). If she missed 1958 who can really be surprised because of her teaching workload. 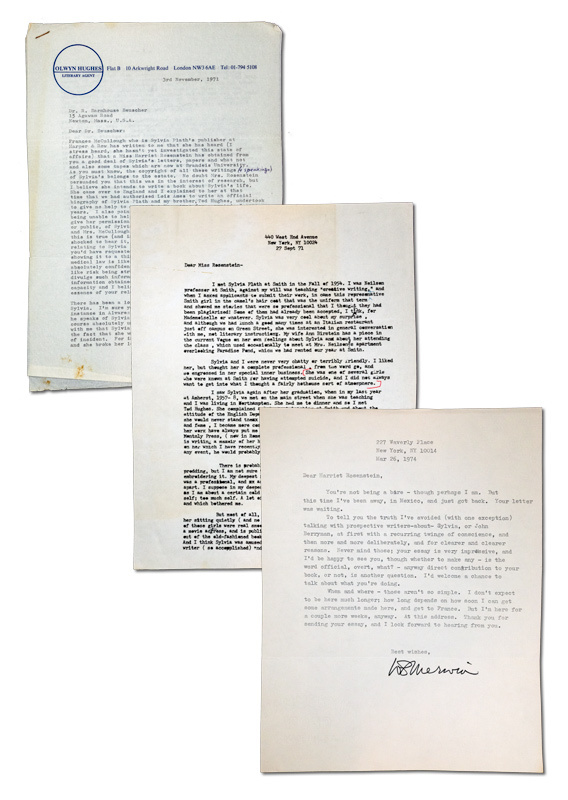 Plath appears to have submitted the Colossus manuscript to the Yale Series sometime in February 1960, possibly within a week or two of signing the contract with Heinemann for their edition of the book. Mrs. Plath let her daughter know that she had received an acknowledgement of receipt of the manuscript by mid-March 1960. With the typescript of The Colossus at the Lilly is an unsigned rejection notice from the Yale University Press dated 2 August 1960. Plath had listed the return address as Wellesley so the book was sent back there. 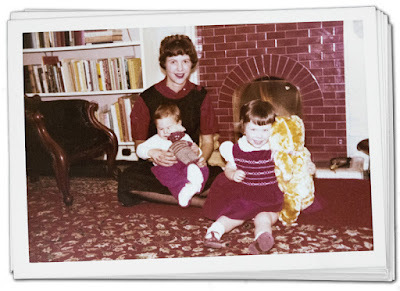 She wrote her mother on 16-17 August 1960 and told her that when it was returned to "Keep the ms. & use it for scrap." The winner that year was Alan Dugan. The previous winners that Plath went up against were: John Ashbery (1956), James Wright (1957), John Hollander (1958), William Dickey (1959), and George Starbuck (1960), whom she lost to "by a whispers". Except for Plath, not many misses there! As I did with Circus in Three Rings below is a list of the poems in this Yale submission followed by a exact or circa date of creation for each. Two Views of a Cadaver Room, late July 1958? Night Shift, late July 1958? A bit of the second "o" in "Elmwood" is visible as is a bit of the "a" in "Plath" is visible, too. The list of acknowledgements on page 3 that Plath typed at the beginning is capital I Impressive. But it, as well as the quality of the poetry, was not enough to sway her jurors. Comparing this Yale submission with the contents of the book as Heinemann published it shows that like the crab in "Mussel Hunter at Rock Harbor" Plath was ever the fiddler. There are two additional poems in the Yale manuscript and, as well, some shuffled around poems. Present in the Yale submission, but absent from her Heinemann manuscript, are the poems "Owl", "The Beggars", and "Ella Mason and Her Eleven Cats". Also, in the Yale manuscript, "The Bull of Bendylaw" and "All the Dead Dears" are flipped. Additionally, the other notable poem is "Spinster" which is located in The Colossus after "Moonrise", while in the Yale manuscript it is four poems lower down. What can we make of Plath adding the two poems ("Owl" and "Ella Mason") to this manuscript? Are they more "American"? What do they add? All links accessed 7 March 2017. Western Massachusetts bookseller, Ken Lopez, is selling a major collection of Sylvia Plath materials. The Harriet Rosenstein Sylvia Plath Archive is listed on his website with a sale price of $875,000. A hefty sum for, frankly, a hefty amount of important Plath and Plath-related documents. The news has me feeling like a kind outside of candy store. I can see inside, but cannot get it. The highlight of the collections are the letters and other papers that originated with Plath's "psychiatrist" Dr Ruth Beuscher Barnhouse. Included here are 14 letters from Plath to Beuscher (as was her then surname), from 18 February 1960 to 4 February 1963. Lopez estimates the 45 pages of letters consists of "about 18,000 words". 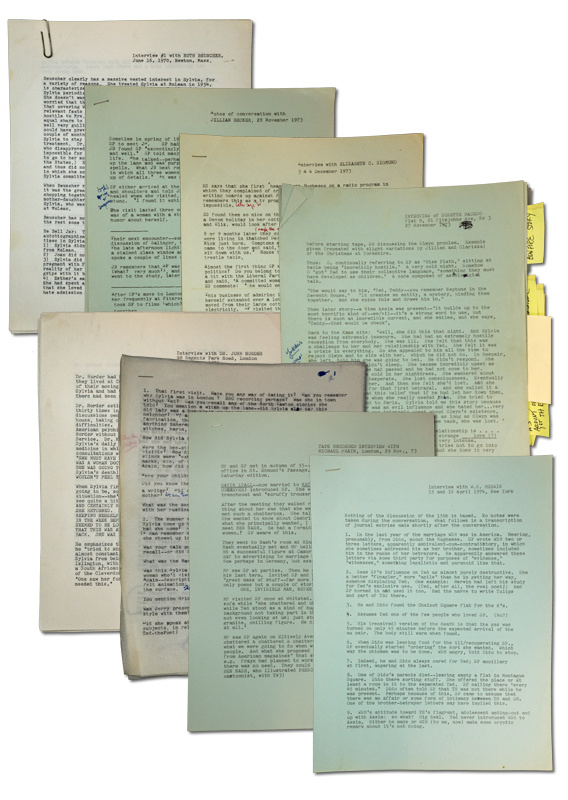 In addition to the letters, there are files related to Plath's treatment at McLean Hospital from 1953-1954. Normally off-limits, these documents may reveal quite a bit about Plath's decision to attempt suicide in 1953, as well as perhaps divulge other biographical information about a period that is generally skinny on information. Lopez's description of the collection and inventory leaves a little to be desired. He writes, "In an interview given less than a year before her death in 1999, Ruth Barnhouse claimed that she had 'burned the dozens of letters she received from Plath while she lived in England.' This was not true." However, Lopez's claim is not, itself, true. Plath likely wrote at least 11 letters from circa 27 September 1954 to circa 21 May 1956. 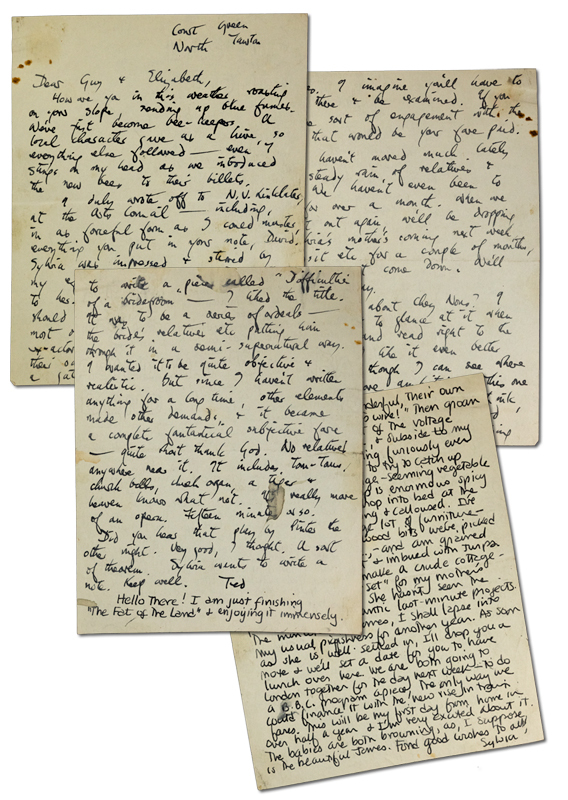 The evidence of these letters exists in two places: Plath's own letters to her mother, and her pocket calendars held by the Lilly Library, Indiana University at Bloomington. Plath used these pocket calendars to track many things: dates, meals, cultural events, school obligations and letters sent (actual and/or intended). The pocket calendars end around December 1956, so who knows how many additional letters were sent from Cambridge, Northampton, and even Boston between then and December 1959. The letters from Plath to Beuscher are undoubtedly going to be some serious, heavy, and emotional reading. The experiences Plath endured and the nature of the trust between herself and the recipient means that these letters will represent a style of writing that has no parallel. However it must also be remembered that the very nature of the relationship between Plath and Beuscher has been severely criticized. Some of the letters listed in the inventory will be included in the two-volume Letters of Sylvia Plath. However, some are new. In addition to the Ruth Beuscher letters, the letters to Elizabeth and David Compton, Suzette and Helder Macedo, David Freeman, some Melvin Woody, and Shirley and Perry Norton, would be new to the editors (me and Karen V. Kukil). There are also many letters to and from Harriet Rosenstein. Another aspect of this archive that is tantalyzing are the interview notes, audio tapes, and correspondence Rosenstein accumulated in the early 1970s as she was at work on her unrealized biography of Sylvia Plath. Consider that these were obtained within a decade of Plath's death before so much time elapsed and memories were jumbled or forgotten. Lopez astutely writes, Rosenstein "was able to interview many people who knew Plath in widely different capacities, many of whom are no longer living and whose knowledge of Plath and views about her or her work may or may not have been preserved over time by some other means." It is conceivable that personal stories and anecdotes obtained by Rosenstein about Plath will clash with information presented in later biographies. I think in particular of Jillian Becker's papers which is impressive in its size and includes many interviews, letters, a chronology of Plath's last week and a copy of the coroner's report which has since been destroyed as part of regular records disposal p.
A notable absence is Eddie Cohen, but otherwise there are the "usual" suspects such as Marcia Brown Stern, Elizabeth Sigmund, Clarissa Roche, etc. The people from Devon would be really wonderful to "hear", and, as well, Patrcia O'Neil Pratson on Plath's first suicide attempt. Present also are some of the more peripheral acquaintances such as Iko Meshoulam, Christopher Levenson, and Plath's London neighbors. You have to wonder what W.S. Merwin said, considering he was not among those recorded! 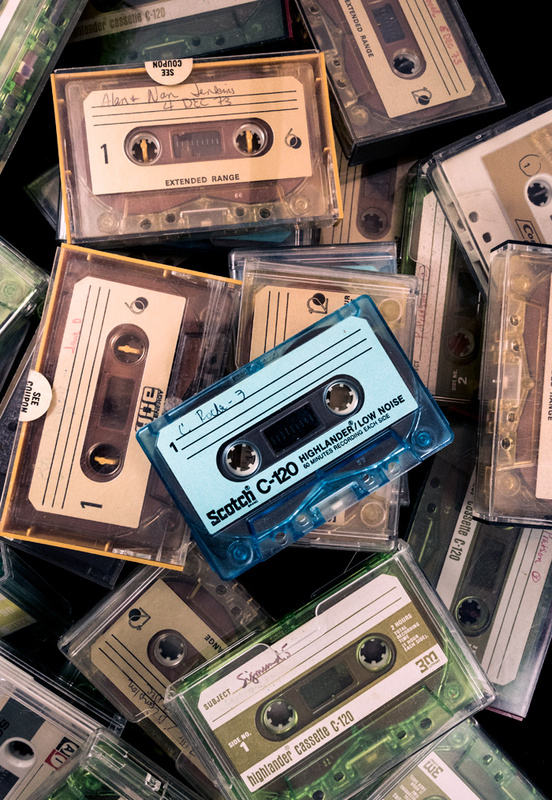 Those audio tapes need to be digitized for preservation purposes! I would love the opportunity to go through everything to correct some mistakes in Lopez's inventory. We have to hope that these materials find their way to a research library. And, as well, that the letters are made available to be included in the forthcoming Letters of Sylvia Plath. It may be advantageous for them to know which letters are in the book and which (other than the obvious ones) are not. In the scan above from Lopez's web page, we can see a portion the blue aerogramme containing the postmark. This must be a scan of Plath's last letter to Dr. Beuscher, which Plath dated 4 February 1963. Plath wrote a few other letters that day. The letters to Aurelia Plath and Marcia Brown Stern are also blue aerogrammes and were postmarked 5 February 1963 at 1:45 pm from London NW1. Beneath each postmark is the letter B. The letter from Plath to Father Michael Carey was sent to Oxford, and the envelope was not apparently retained. But the postmark in the above letter is for 12:45 on 8 February 1963 and also with the letter B in London NW1. Why did Plath hold on to this letter for four days before mailing it? Was it posted at the same time on the 8th as her "last letter" to Ted Hughes? Or, did Plath write it after the 4th and misdate it? It is possible some of the contents of the letter may answer this. All links accessed 9 March 2017. One of the most fascinating aspects of studying Sylvia Plath's poems, particularly the late poems, is considering them through the lens of their creation date. That is one way to read them, and in doing so you can sometimes see her using words and images in a consistent fashion, but also seeing how she progresses through her subjects. For example, if you read the October 1962 poems in chronological order you can see Plath reshaping her self, if you will, in her "Bee" poems written from 3 to 9 October. After reestablishing that self (a poetic selfie? ), she turns to shed external, familial subjects (burdens) like her father and mother "Daddy" and "Medusa" respectively, written back-to-back as it were on 12 and 16 October. (Plath had spent the weekend after writing "Daddy" out of town in Cornwall.) But yet the poems read quite differently when done so in the published book format. Though written second, "Medusa" appears first in Ariel: The Restored Edition, separated from "Daddy" by six poems: "Purdah" (29 October 1962), "The Moon and the Yew Tree" (22 October 1961), "A Birthday Present" (30 September 1962), "Letter in November" (11 November 1962), "Amnesiac" (21 October 1962) and "The Rival" (July 1961). The unbelievably awesome Lilly Library at the University of Indiana, Bloomington, holds, among other treasures in Plath mss II, Sylvia Plath's manuscript book collection that she titled Circus and Three Rings and assembled towards the end of her senior year at Smith College in May/June 1955. Most of the poems were written in the final semester, January-April 1955 when Plath was taking a special studies course in poetic composition with Alfred Young Fisher. But, like her later books, Plath mined her older writing too, selecting those poems she felt held up with her more recent work. Below is a list of the table of contents of the poems in Plath's Circus in Three Rings. The title of the poem is followed by a common and then the date of creation, if known. I "Green as a melon our sweet world was"
II "My extravagant heart blows up again"
III "Circling zodiac compels the year"
Plath divided the book into three sections. Section I, "Green as a melon our sweet world was" takes its title from Plath's poem "Song of Eve". Section II, "My extravagant heart blows up again" takes its title from Plath's poem "Circus in Three Rings". Section III, "Circling zodiac compels the year" takes its title from Plath's poem "To Eva Descending the Stair". So, maybe you want to read Sylvia Plath's Circus in Three Rings? There are two ways to do it. However, though it may a challenge because, of course, not all of the poems are published.